This premium finishing compound removes light gelcoat oxidation, fine sanding scratches, and swirl marks. It produces a high gloss finish ready for wax. Step 2 in our comprehensive marine polishing system that removes oxidation, restores color and shine, and ensures long-lasting protection. Removes fine sanding scratches & swirl marks. Works well on faded or neglected gelcoat. 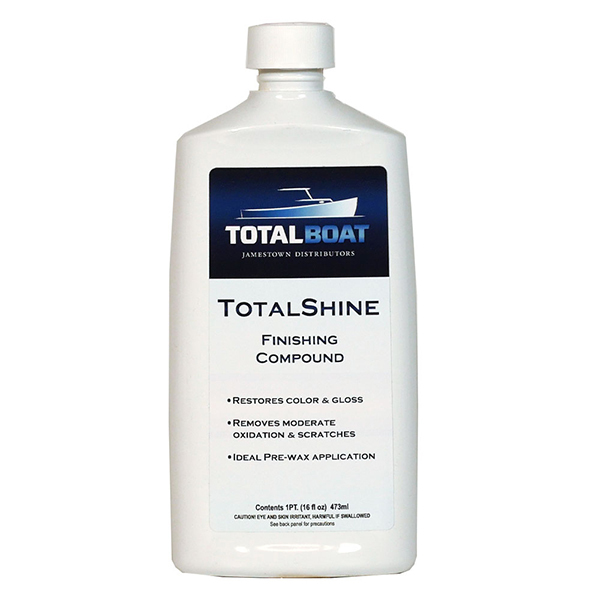 TotalShine’s fine cut abrasive polishing agent removes swirls and fine scratches. For badly neglected gelcoat or paint, you should first use a more aggressive compound like TotalBuff. On newer boats or those with only light oxidation, you can often skip the rubbing compound. Totalshine produces a high-gloss wet look finish when used with a polisher and good wool polishing pads. Because this is a pure polishing compound, it contains no wax or silicone. Follow up with a good wax and you are ready to hit the water. We’ve developed the same type of multi-step system professional boatyards use. TotalShine is step two in our 3-step system, preceded by TotalBuff to remove heavy oxidation, and followed by TotalBoat Premium Boat Wax last for extended protection (both sold separately).